Deck-O-GRIP is a water based compound contains a slip-resistant additive, which establishes an easy-to-clean, non-slip surface for traditionally slippery areas. Deck-O-GRIP offers improved resistance to most of todayâs common pool chemicals. It is specifically designed to retain and enhance the appearance of colored concrete and exposed aggregate surfaces for years to come. Offers excellent non-skid foot traffic wearing qualities and can be recoated after thorough surface cleaning to restore original beauty. One gallon of Deck-O-GRIP will cover 300-600 square feet, depending upon the porosity and condition of the concrete. 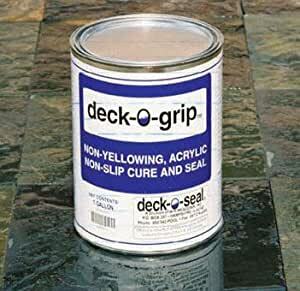 Deck-O-GRIP is a non-yellowing, acrylic-based, high solids, transparent, easy-to-apply liquid cure and seal. It provides a clear, flexible and durable abrasion- and stain-resistant protective film. DECK-O-GRIP also offers improved resistance to most of todayâs common pool chemicals. It is specifically designed to retain and enhance the appearance of colored concrete and exposed aggregate surfaces for years to come. The compound contains a slip-resistant additive, which establishes an easy-to-clean, non-slip surface for traditionally slippery areas.